Two weeks of war 4.5 out of 5 based on 6 ratings. 6 user reviews. –Did you know he went off to join the militia? –Militia? He left home on January 13? And two weeks later I was contacted by the wounded. Aleksandr Vladimirovich Koshurkin was right away sent to Debaltsevo. An old friend told me this story. His friend went to Chechnya, during the first war. He and other draftees arrived at Groznyy and they were taken to their unit. On the way they struck a mine or something. He sat right above a wheel which is what saved him. He was the only survivor from that vehicle. Half of his body was peppered with fragments, which only slowly came out. They didn’t even arrive yet, all these kids. 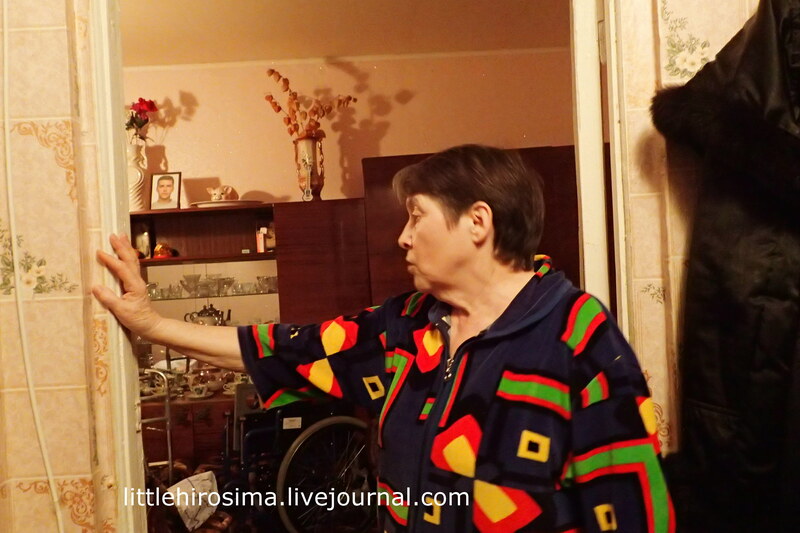 We enter the apartment and are met by a wizened short woman. As she was walking away from the door to let us in, I noticed she limps badly. It took me off guard. The folks at Pervomaysk administration told me this address needs a walker. But it was supposed to be a guy. –A monument fell on me. Marx. Went and fell. The woman started to show me how the monument fell on her. She thrusts her arms forward and recoils. –It was at work, at the factory. It fell flat. Since then I have a limp in both legs. We are still at the door, not sure what’s happening. –We brought you a walker. –Thank you! Sasha could really use it. Now I see an elbow on a couch armrest in the living room. 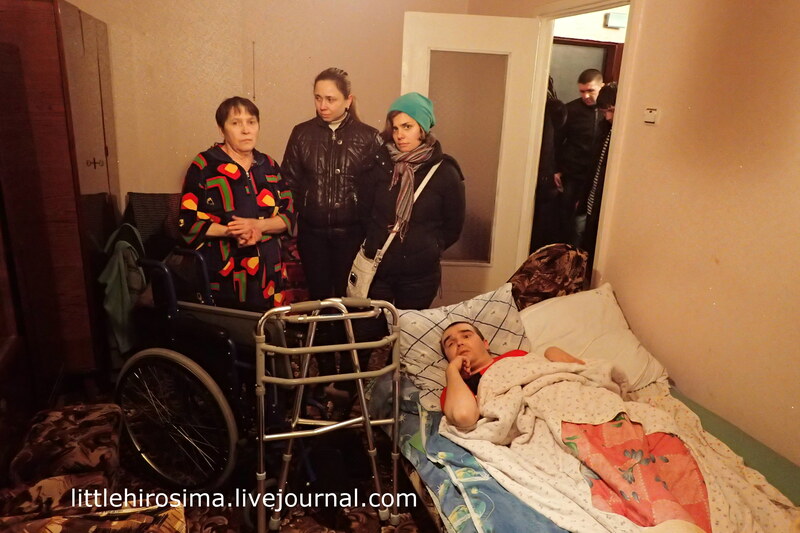 –He was wounded in Debaltsevo on January 27. He went off to fight. –Did you know he joined the militia? 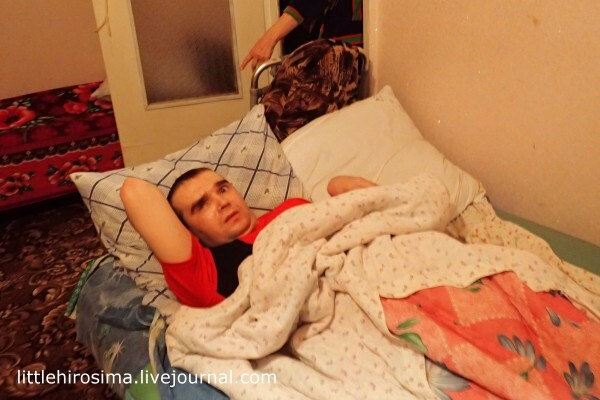 Aleksandr Vladimirovich, born 1983, was wounded after less than two weeks of service. In the head. He underwent several operations. Was taken to Moscow. They told him there is a chance he will fully recover, but only if he trains intensively, and that will take a lot of time. Aleksandr lies on the couch and moans. He has trouble focusing. –Is he conscious, does he understand? –Yes. But doesn’t speak well. He lies like a small child. Hand against the face, and he covers his head all the time. Or rather its right part. As if trying to hide it. –Do you need a wheelchair? –Very much! He walks, but still has difficulty transferring. 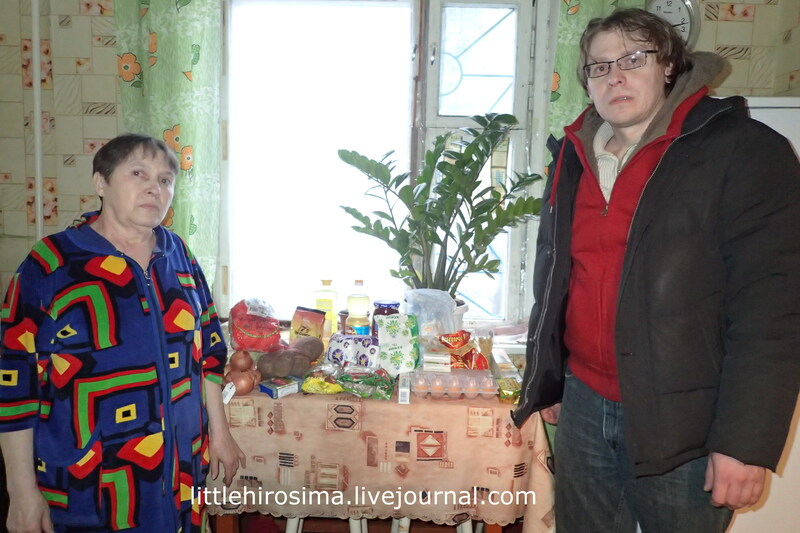 We had a wheelchair in the car which we received from a woman to deliver to Donbass. We took it just in case as we left Lugansk for Pervomaysk. While the guys were taking care of him, Galina Ivanovna went toward the back of the room. 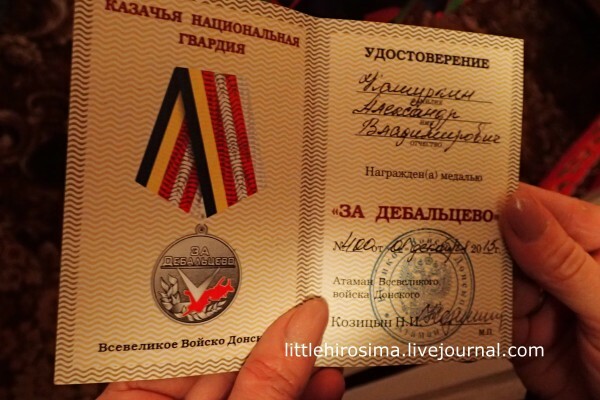 She came a few minutes later, started to show me the medals and documents. Aleksandr moaned again. I’m trying to tell apart the words, but can’t. His wrists are twisted, as if he had Parkinson’s, his eye is half-closed. It leaves the impression he is unsconscious. Next to him adult diapers. And all the while he’s trying to tell me something. –Does he have wife, children? –There is a daughter. His wife left him a long time ago. –Five years old. At first didn’t understand what was happening. I asked her “do you remember daddy?” and she replied “mom said not to mention.” And then she started to visit. She’d bring a stool and sit next to him. If she eats, she always takes some to her father. Apple, tea. We mainly assist the civilians. Children, retirement homes, orphanages, elderly…This is the first time I ran into a wounded soldier. Aleksandr, Sasha, joined the militia a year ago. At the time of the Debaltsevo cauldron, where he fought. In January 2014, the acting mayor of Pervomaysk Yevgeniy Ishchenko was killed. At that time we couldn’t even reach Pervomaysk, it was under heavy fire. We waited and waited, hoping it calm down, but it didn’t. Shells kept falling and falling, continuously and monotonously. That’s when Aleksandr went off to war. Straight off to hell, where it was worse than anywhere else. Galina Ivanovna looks extremely tired. She limps and fully takes care of her son. Changes diapers, does exercises, feeds, washes. It’s hard to do in the apartment. I can imagine it right now, that apartment, with a big mirror opposite the door, with windows covered with adhesive tape from corner to corner, an icon next to Sasha’s bed, and Galina Ivanovna herself walking heavily. I also see a girl who sits on a tiny stool next to her father and gives him a piece of apple. And he covers his face with a hand that’s clenched by a spasm and tries to say something very important.